I'm a guitar player and have recently picked up the violin. I'm really enjoying playing it and progressing very quickly (especially with the left hand). When practicing scales, I've introduced some vibrato to make practicing more interesting. 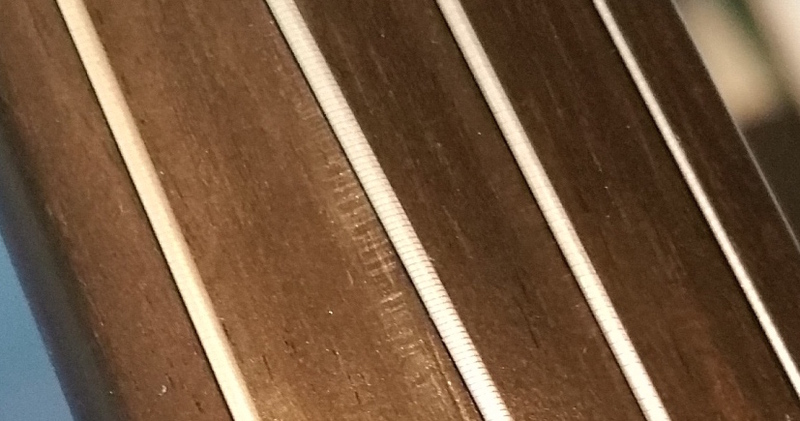 On guitar, vibrato is done by slightly bending the string, but from what I've seen when performing vibrato on violin, you do not bend, it's more of a lateral motion along the string. 1. Is this bad for the instrument and should I stop doing this? 2. Is what I'm doing considered an acceptable type of vibrato that people perform on the violin? 3. Is scratching on the fingerboard common? I can't seem to find anything on google that answers this. Welcome to our fantastic family of string players! Vibrato on a violin has usually done by bending the fingerprint back and forth in a controlled fashion. The damage to the fingerboard will need to be fixed in the future eventually but remember it doesn't have frets which take all the pressure and sliding motion of a guitar or other fretted instrument. It will be difficult to finger notes on the fingerboard in your upcoming years of playing properly when you're concentrating on bending a string. In other words, your mind and muscles will be trying to push a string up and not be paying attention to the fingfering of the string next to it that will be getting bowed next. On fast tunes it will be impossible to "vibrato" by bending a string. Here's a link to the tutorials that you can find over to the far right side of this thread. Is it bad? Well, it is damaging the fingerboard. Eventually that will make the instrument harder to play properly, and need either repair or getting a new instrument. Most people tend to want to avoid that. Should you stop doing it? I suppose it depends on how often you want to replace the instrument or have it repaired. Is it generally considered an acceptable type of vibrato on violin? Not really. Violin vibrato works more by rolling the finger along the length of the string than bending it sideways. So far as I know, teachers and etc wouldn't be recommending bending the string. Is scratching on the fingerboard common? Well, I don't know how long you've been playing on that particular violin, but scratches like that aren't something I've seen in the 3 yrs I've been playing. Wear does happen on the fingerboard, they don't last forever. But that looks like it is digging it up pretty good. There are some guitar vibrato techniques that are quite close to how it is usually done on violin, but that is most often used by classical guitar players for a more subtle vibrato than bending the string. Bending the string isn't really necessary on violin. If you want a note to bend up in pitch, you can just slide your finger up and get that sound, since you don't have frets to cope with. I would say there is some similarity between guitar and violin vibrato in the need to relax the hand, wist and sometimes the elbow enough to allow the movement to be be easy and fluid. But how the effect is produced and what is happening to the string when you do it is different. Thanks for the replies. Very helpful. Probably not suitable to the violin for the reasons mentioned but I would still love to hear a demo. I'm curious more than anything else. We have had this discussion before here but I don't recall a demo video. With great quality Ebony I believe it would take a very long time to damage the fingerboard enough that you would need to plane it. What happens if you use grade 0000 fine steel wool on those scratches? Looks a little bit like coloring from aluminum rather than scratched Ebony. Perhaps it's worse for the strings. Topic: Well, here I am.